Having full use of your hands is something that many of us take for granted. However, as muscle mass declines with age, the reality of life without the range of motion we are used to in our hands comes into focus. Declining strength in your hands doesn’t have to interfere with your quality of life, though. There are numerous products on the market that can help you regain the usefulness of your hands, specifically in the kitchen, as you’ll see in our Best Dinnerware and Utensils for Elderly 2018 review. What Factors Affect the Seniors’ Ability to Enjoy Eating? What Features Do These Items Offer? What If I Am Self-Conscious Using These Products? 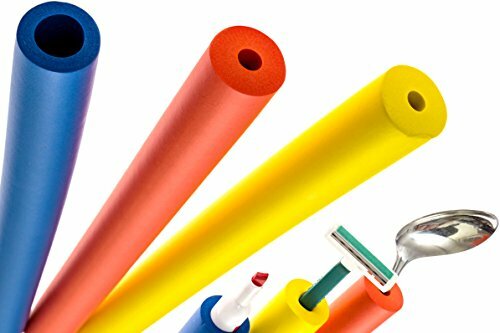 The Impressa Products 6-Pack of Foam Grip Tubing solves a myriad of issues you may encounter in the kitchen, as the health of your hands becomes a consideration. The package includes two tubes in three different diameters so that you can match the size to the utensil or tool. All have bright, attractive colors which add a bit of vibrancy to the dining experience. They won’t absorb water so, feel free to throw them in the dishwasher for quick cleaning. They also fit snugly onto your utentsil and will stay in place. 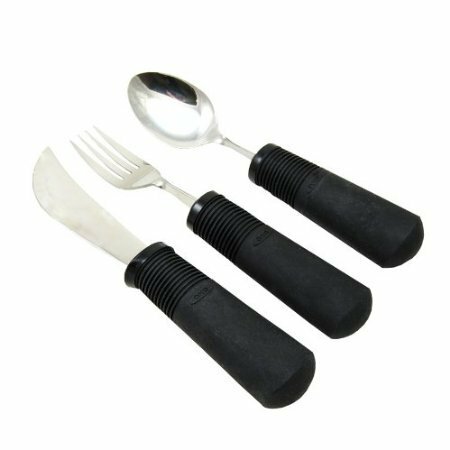 A quality product that works as described for customers to easily hold their utensils while eating. 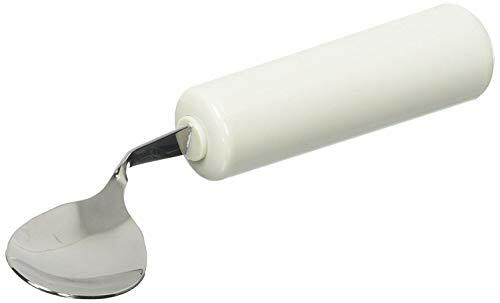 Good Grips stainless steel utensils feature a 1-3/8" (3.5 cm) built-up handle. The OXO Easy Grip Flatware Set is a non-weighted set of dining ware grips that includes a fork, knife and spoon. The handles are textured to help you keep a firm grasp of the utensils. They are also slip-resistant and have a comfortable feel when held in-hand. The stainless steel pieces are dishwasher-safe, as well . Though this set is on the pricey side, it can be an worthwhile expenditure for individuals who truly require an alternative to traditional eating utensils in order to enjoy their mealtimes again. The grips are comfortable and slip-resistant. The BUNMO Adaptive Utensils have rubberized handles that are slip-resistant and have a particuarly pleasing fee. The set comes complete with a couple of extra pieces that we don’t always see in these products. They aren’t heavier than regular eating utensils, employing a balance that makes them easy to pick up. 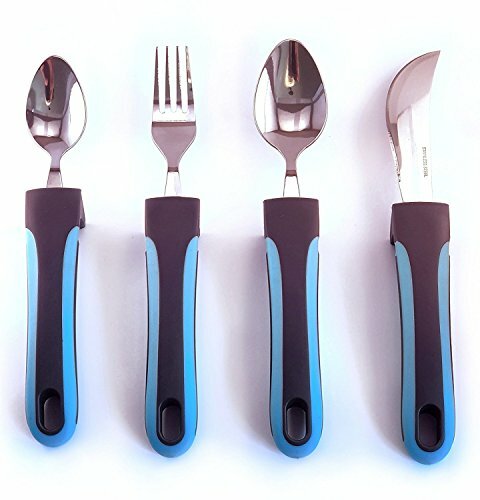 Individuals who experience trembling will find that these utensils were made with them in mind, giving them back the agency to finish meals without frustration or messes. The unique ergonomic design makes eating easier for those with limited mobility. The Homecraft Queens Right-Handed Angled Cutlery Spoon is designed to take a bit of a sharp departure from the standard utensil to create one more in tune with individuals who need assistance when eating. The unique shape makes it easier to use than conventional ones. It is comfortable to hold and designed to give those who limited mobility a helping hand, by allowing them to approach their food at a more comfortable angle. The bright color provides improved contrast for a more pleasant eating experience and is specifically designed to help those with dementia and Alzheimer’s. The manufacturer designed each piece with the individual in mind. The utensils bend to make using them more manageable. All the pieces are dishwasher-safe. The shapes of the cup and bowl reduce slips and drips. The bright color provides excellent contrast. Some might find the utensils too large and awkward to handle. You can’t put them in the microwave. The Essential Medical Supply Power of Red Complete Table Setting offers a useful solution to help individuals with dementia or Alzheimer’s disease maintain a healthier weight. The bright color provides diners with a bright color contrast to make distinguishing foods easier. 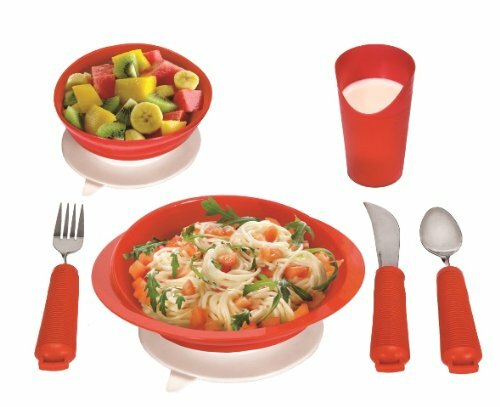 Each piece makes eating more manageable as it is washed in a bright red that keeps you alert and engaged during meal time. This well-designed plate benefits both individuals and caregivers. 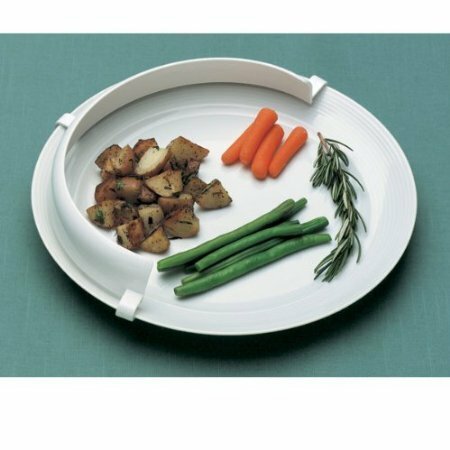 The Sammons Preston 81005586 Hi-Lo Scoop Plate is a lightweight item with a curved design that helps food remain inside of the plate. When an individual who may have trouble scooping food uses a fork or knife to grab food from the plate, the slanted surface aids them in digging into the contents inside. A lot of thoughtfulness went into the design for both the individual and the caregiver from the rubberized base to the 0.75-inch rim. An affordable solution to a vexing problem. 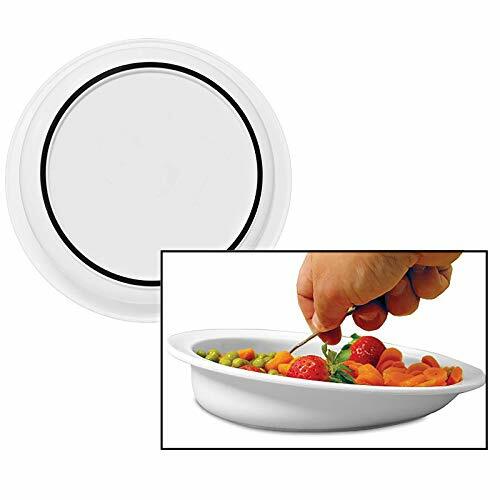 The North Coast Medical NC35213 SureFit Plastic Food Guard offers a universal solution to the worrisome issues of eating while experiencing mobility issues within the hand. The piece snaps onto the edge of the plate to provide a barrier that reduces spills. It is just the right height and will fit on most any dish. It’s a smart choice to take with you when going out to eat a restaurant. It also is an affordable option to use if you would rather modify your existing plates, rather than replace them. The other thing to bear in mind is eating a healthy diet is imperative for your continued well-being. If it becomes difficult, you may miss out on vital nutrients. If these items can help you overcome any obstacles to enjoying your meals, they have served their purpose and have provided invaluable benefits. Several things can affect you or your loved one’s enjoyment of mealtimes. Injuries can cause pain that makes it harder to hold utensils. Other conditions such as carpal tunnel syndrome can lead to weakness and numbness in your hands which can also interfere with eating. Arthritis is another common reason because of the subsequent swelling of the joints. Sometimes, the discomfort borders on excruciating, especially if the symptoms involve any nerve contact. Pressure can trigger repeated firing of the neurons followed by chronic pain. And because it involves everyday things, it can affect your quality of life. That’s why these products are so valuable because they provide relief or at least another way to manage. Many of these products provide upgrades in the design and weight distribution of the utensils to make them easier to hold and handle. They typically make use of the principles of ergonomics to make you more comfortable whether it’s at home or work. While you may think of it only as improvements in the look of objects, the benefits often spill over into your mental and social well-being too. You’ll find utensils and dinnerware for everyday use as well as others that the manufacturers have designed for specific health issues. Their purpose is to overcome the challenges and make your tasks easier and more efficient. You’ll find items that address any potential obstacle with a solution that is geared toward supporting both the caregiver and the individual. It may surprise you to learn how much these factors affect your use and enjoyment of an item. They also alleviate some of the mental burden of feeling unable to take care of yourself and your needs. Even little things like the color of an object can impact the user experience. Manufacturers often work with professionals in the field including occupational therapists to provide practical solutions. It’s worth noting that these upgrades in the technology benefit you on another perhaps unexpected front. If manufacturers can make their products more efficiently and less expensive, you’ll save money in the long run too. It’ll also increase your chances of getting something that is useful and fills a niche well. If you’re not sure which ones to get, consult an occupational therapist who will help match the products you’ll need with your independent living goals. It’s natural to have second thoughts about using these items, especially if you’re new to them. It’s part of the human condition to want to feel that you’re part of the group and like everyone else. Using ergonomically designed products isn’t a sign of weakness. In reality, it is the opposite. You’ve chosen to make your life easier and take action. How could anyone find fault with that goal? The essential thing to remember is that you’re not alone if you feel like you need extra help. The Arthritis Foundation estimates that about 25 percent of American adults have arthritis in one form or another. Researchers expect that figure to rise to nearly 50 percent by 2040 as baby boomers age. That’s good news for you and anyone else who uses these products. The subsequent increase in demand will fuel a whole new generation of items and spur R&D toward better solutions. It’s the classic win-win situation. Everyone will benefit from it in the long run. However, we understand your concerns. Rest assured that improving your quality of life is an admirable endeavor. Congratulate yourself for taking the necessary steps. The other thing to bear in mind is eating a healthy diet is imperative for your continued well-being. If it becomes difficult, you may miss out on vital nutrients. If these items can help you overcome any obstacles to enjoying your meals, they have served their purpose and have provided invaluable benefits. That fact alone makes them priceless and worth the investment. The best dinnerware and utensils for the elderly seek to find ways to get rid of the frustration of simple tasks that have become difficult. They offer ways to improve your mental, and, thus, physical well-being by removing obstacles to a fulfilled life. Our advice is to see them as opportunities rather than anything negative. There’s nothing wrong with taking those extra steps in the direction of convenience.